3E Fashion Jewellery Co. Ltd. has been established in 2006 for its specialty in stunning custom jewelries, covering everything from standout Cubic Zirconia jewelry pieces, subtly cool stainless steel accessories to daily wear sterling silver collection. We also add various elements and design ideas to make our jewelry more gorgeous and unique. Clusters of color zircons, asymmetric metal castings, polished synthetic pearls, pastel-themed glitter stones, all of these contribute to our unrivaled collections of expertly crafted fashion jewelry for every occasion. We also offer various kinds of packaging ideas, from jewelry displays to velvet pouches and cardboard boxes, aims to add luxe and value to any gifts. Our truly unique and affordable custom jewelries plus packaging ideas make perfect gifts for all occasions. 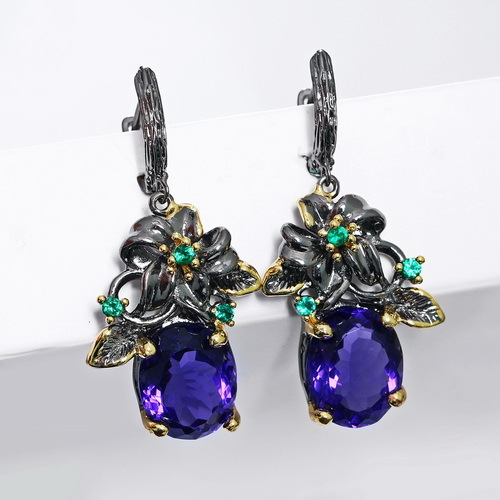 This is a very unique and fashionable pair of women earrings. Setting with top grade Cubic Zirconia crystals, with gun color plating, this earrings pair is the best for parties, and casual gatherings. We have developed lots of black gun color plated jewelry, ranging from rings, earrings, bangles, and necklaces. They are also in the gothic theme, very trendy and fashionable. We also supply velvet pouches and gift boxes, to add extra value and make perfect gifts for all occassions.